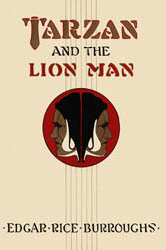 Tarzan and the Lion Man is a novel by American writer Edgar Rice Burroughs, the seventeenth in his series of books about the title character Tarzan. The novel was originally serialized in the magazine Liberty from November 1933 through January 1934. It satirizes Hollywood's treatment of the Tarzan character and even spoofs Burroughs' own work. It was written at a time when Johnny Weissmuller was becoming a movie star by playing Tarzan as an illiterate character, to Burroughs' open displeasure. Tarzan and his lion companion Jad-bal-ja discover a mad scientist with a city of talking gorillas. To create additional havoc, a Hollywood film crew sets out to shoot a Tarzan movie in Africa and brings along an actor who is an exact double of the apeman, but is his opposite in courage and determination. Later, as John Clayton, Tarzan visits Hollywood to find himself in a screen test for a role in a Tarzan movie. He is deemed unsuitable for the lead role because he is "not the type." The book has been adapted into comic form by Gold Key Comics in Tarzan no. 206, dated February 1972, with a script by Gaylord DuBois and art by Paul Norris, and later by DC Comics in Tarzan nos. 231-234, dated July 1974-January 1975, adapted by Joe Kubert.